Born in Kamenets-Podolsk. In 1950 he graduated from Kyiv engineering-construction Institute. 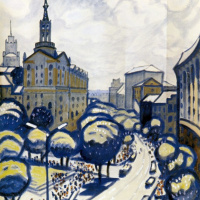 In 1955 – 1958 he studied at the graduate of the Academy of architecture of the USSR. Teachers – J. Steinberg and A. Shovkunenko. The participant of Republican, all-Union and international exhibitions since 1956. Member nuau (1966), honored worker of arts of the USSR (1990). He taught at the Kiev civil engineering Institute (1964 – 1985), KHI (1989 – Professor). Conducted dozens of personal exhibitions in Ukraine and abroad. Worked primarily in the techniques of watercolor, gouache and monotypes that depict architectural monuments of Ukraine, Russia, the Baltic States, Central Asia, the Caucasus, Finland, Poland, etc. Illustrated magazines, books on history and culture. Works are in the namu, the Kyiv history Museum, HM Russia, the Baltic States, Poland and other countries. April 12, 1928 in the city of Kamenets-Podilskiy Podolsk Khmelnitsky region. An architect and artist. Honored worker of arts of Ukraine, member of the National Union of artists of Ukraine, honorary member of the Academy of architecture of Ukraine. In 1959 he graduated from the Kiev civil engineering Institute in 1959 - the graduate school at Academy of architecture of the USSR. Teachers - O. Shovkunenko, S. Reikowski and V. Zabolotniy. In 1964-1984 he was lecturing drawing and painting at the Kiev civil engineering Institute. The author of many series of works that emotionally reproduces the artistic and aesthetic features of pam"'yatok ancient architecture. Works: easel series - "Trees"Yana architecture of Northern Russia" (1970s), "Pam"atki architecture of Lviv" (1960-1980), "Kyiv", "Chernigiv", "Dnipro" (1950-1990), "Trees"Yana architecture Ukraini" (1989-1990), "Pam"atki architecture Galychyny" (1990), "Pam"atki architecture Krim" (1993), "Vortec Ukraini" (1994). Since 1986, puts drawing and painting at the architectural Department of the National Academy of fine art and architecture, 1989 - Professor. Developed the program and methodological manual on specific methods of teaching drawing and painting at the architectural Department.